DiscountPaint.net :: MANUFACTURERS :: AKZO NOBLE PAINTS LLC :: FLOOD FLD4 PENETROL SIZE:QUART. Penetrol® is a free-flowing, low-odor, high quality penetrating paint additive which compensates for the adverse effects that weather and surface conditions have on paints and primers. 1. Stir and mix oil-based paint thoroughly. 2. 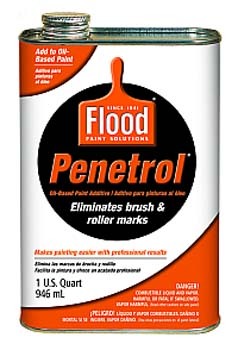 Always mix a small amount of Penetrol with the paint you are using to determine compatibility. 3. As paint begins to set up too fast or “drag”, stir in Penetrol. Begin with approximately one pint (16 oz.) Penetrol per gallon of paint. 4. If paint is thick, or in extreme hot or cold temperatures, more Penetrol may be added (up to 2.5 pints per gallon of paint). Note: For brass, copper, aluminum and chrome, scrub surface with fine steel wool soaked in Penetrol and polish with a clean rag. 1. Remove loose rust, excess dirt, oil and grease. 2. Be sure surface is dry. 3. Saturate the metal with Penetrol. 4. Allow 12-24 hours for drying. 1. Clean surface to be conditioned. 2. Saturate a rag with Penetrol, wipe it on fiberglass surface. 3. Buff surface with a clean, soft cloth within 3-5 minutes. 5. Using an empty can or disposable cup as a measuring device, mix 3 volumes of alkyd (oil Paint) to 1 volume of Penetrol. • Store in a tightly closed container away from heat and flame. BONDO 20092 MASONRY AND STUCCO REPAIR COMPOUND SIZE:QUART. MINWAX 21420 GLOSS PECAN 420 POLYSHADES SIZE:1/2 PINT. NORTON 49211 5" 5 VAC HOLE P180 A/O HOOK & LOOP DISCS PACK:25 PCS. VARATHANE 242180H GLOSS CLEAR OUTDOOR POLYURETHANE 275 VOC SIZE:QUART. VARATHANE 200081 SPRAY GLOSS CRYSTAL CLEAR DIAMOND WATER BASED INTERIOR POLYURETHANE SIZE:11.5 OZ. SPRAY PACK:6 PCS. 3M 02114 100C 9" X 11" PRODUCTION PACK:100 PCS.